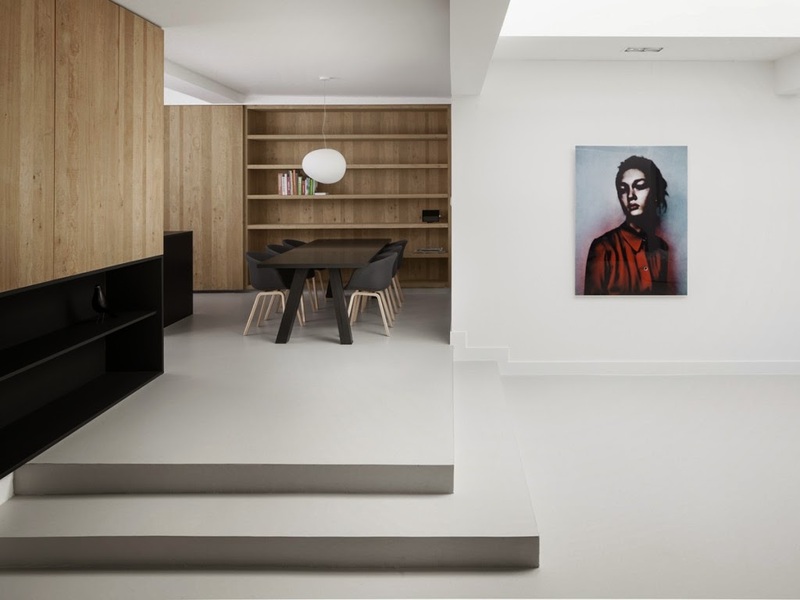 Dutch studio i29 interior architects has converted a former garage space in the centre of Amsterdam into a two-bedroom 230 sq.m. 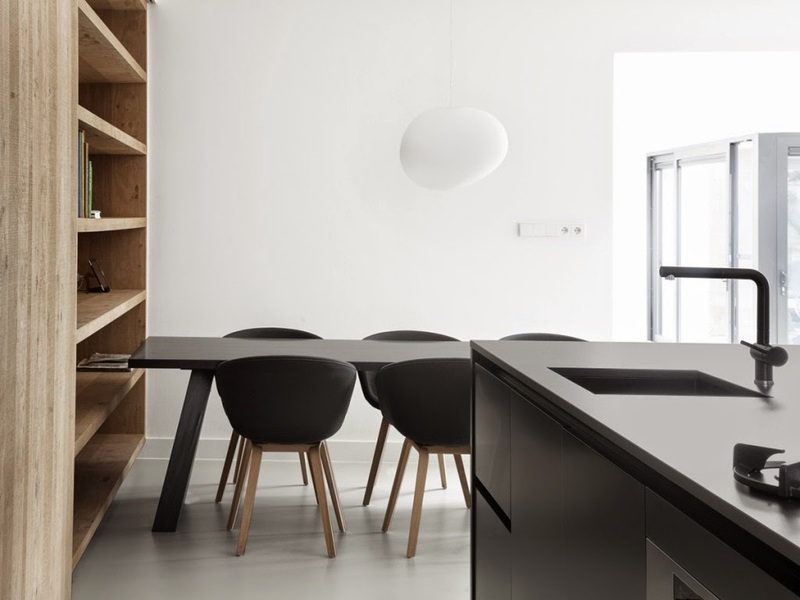 apartment. 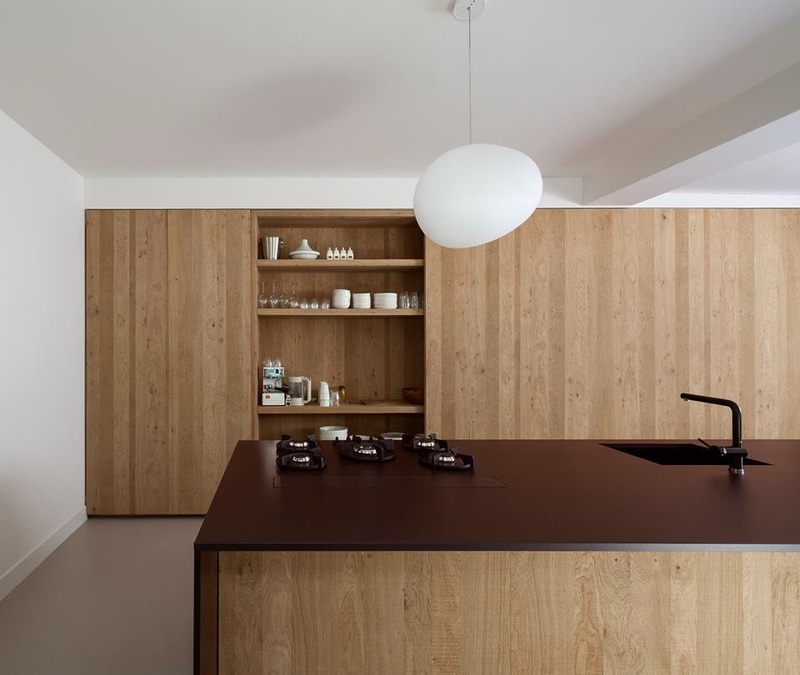 The minimalist interior features oak wooden surfaces that run throughout the house connecting the different areas. 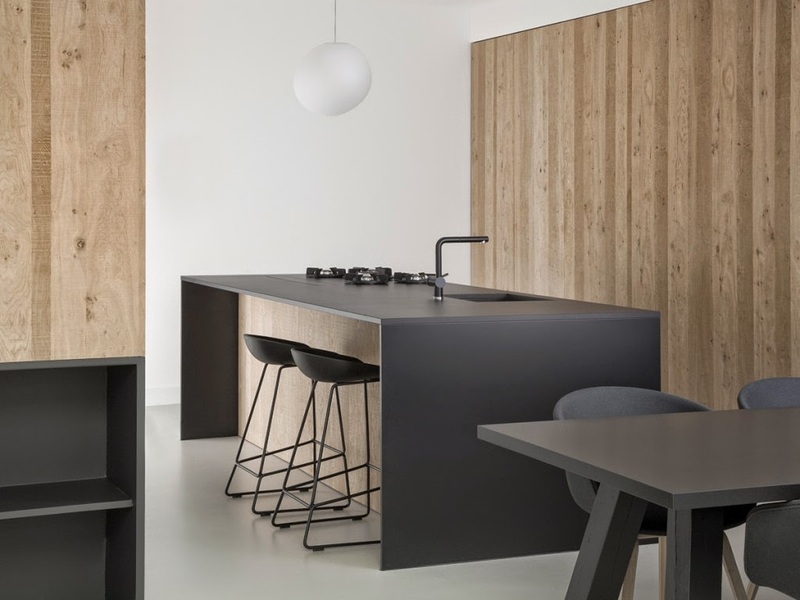 The same wood is applied to kitchen and other storage elements, together with matte black furniture that contrast the all white surrounding walls and the light grey continuous floor. 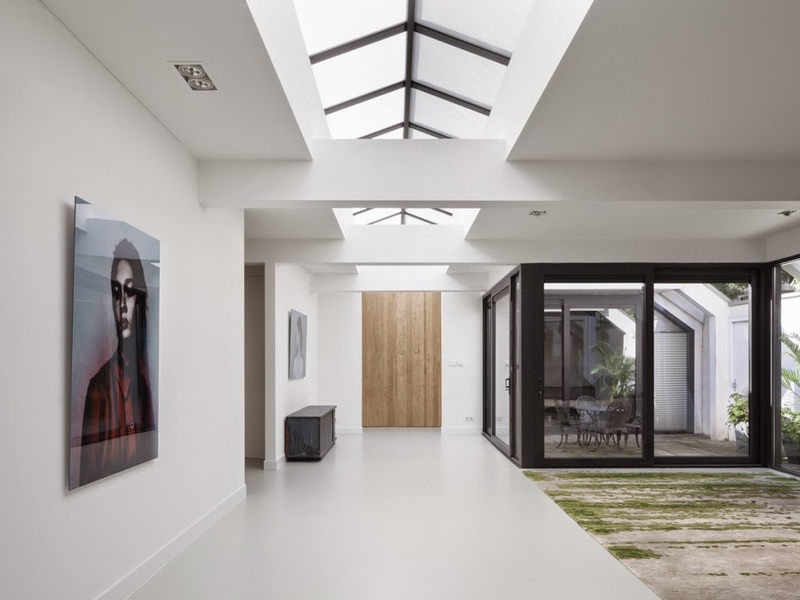 A formerly garage space in Amsterdam’s area de Pijp, turned into a spacious house naturally lit by large roof lights. 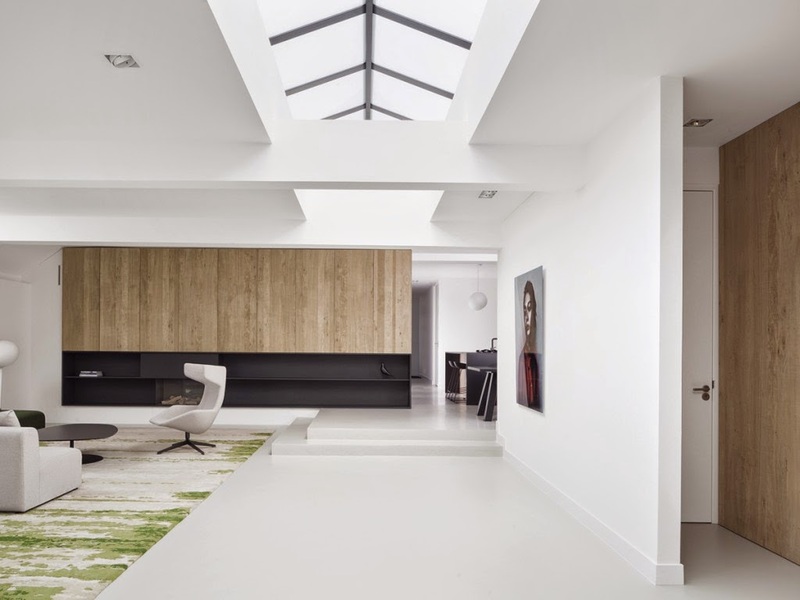 The interior with a generous 230m2 on one floor level is finished in a simple material palette. 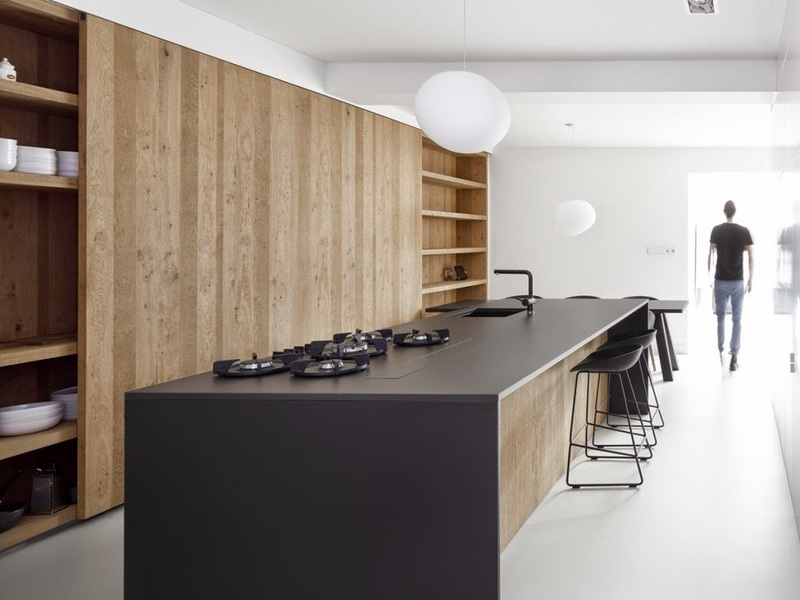 The repetition of rectangular rough oak wooden surfaces is in great contrast with the stark white walls, black surfaces and grey cast flooring. 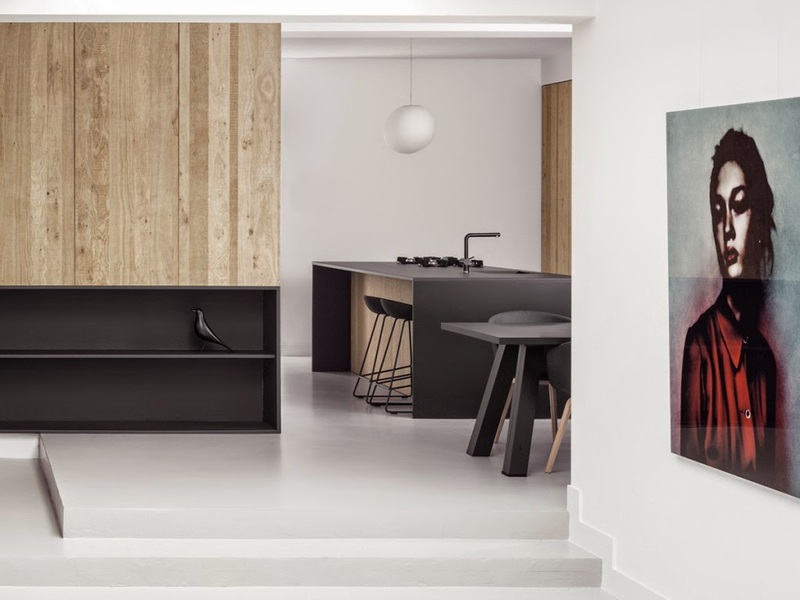 The custom designed kitchen includes a large wooden sliding door to cover integrated storage areas, with a contrasting black cooking island in front. 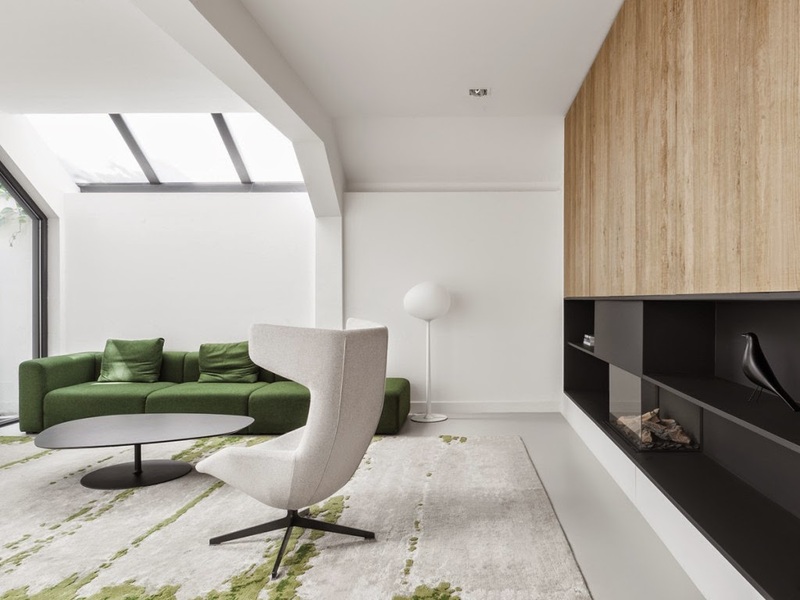 Built-in cabinets and a fireplace have the same characteristics and contrast in materials. 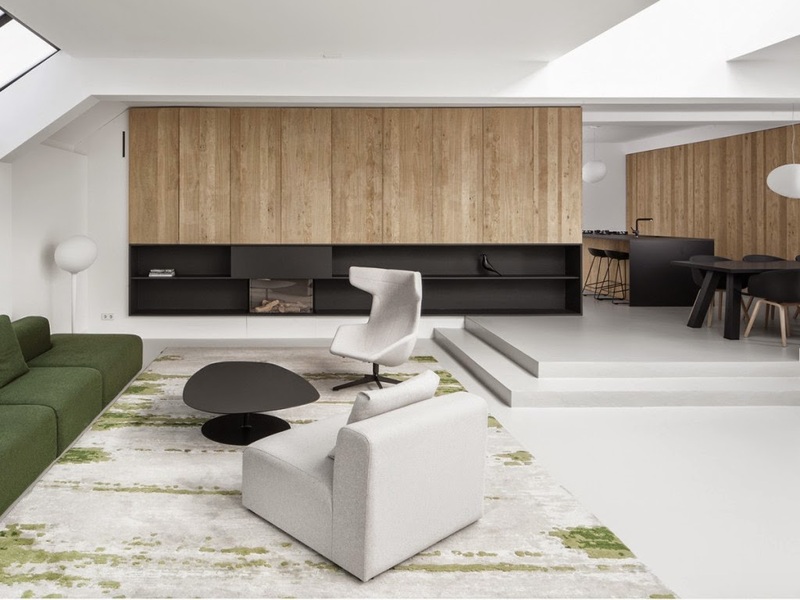 Wooden walls from top to bottom with built-in doors are marking the entrance to the more private areas such as bed- and bathrooms. Outdoors is a patio in between the living- and master bedroom. 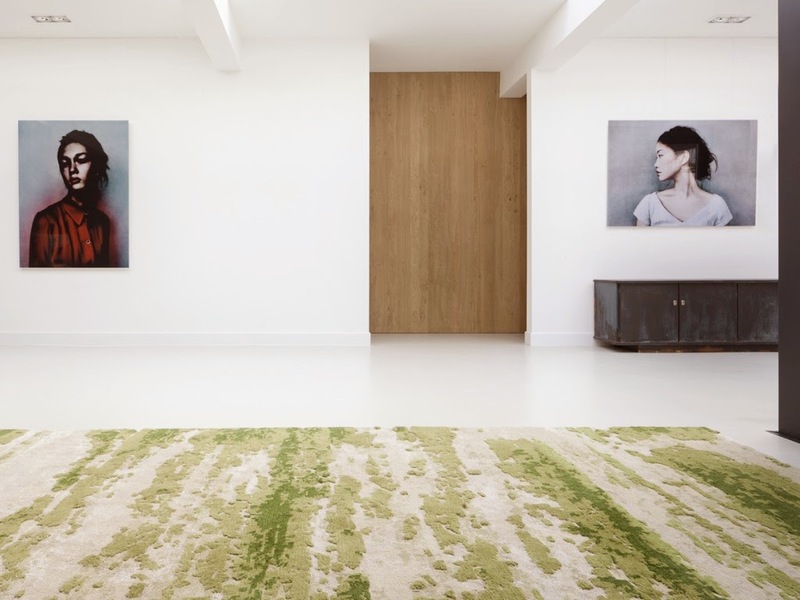 In order to connect inside and out, i29 interior architects designed a 20 m2 hand knotted carpet with a natural mossy pattern. 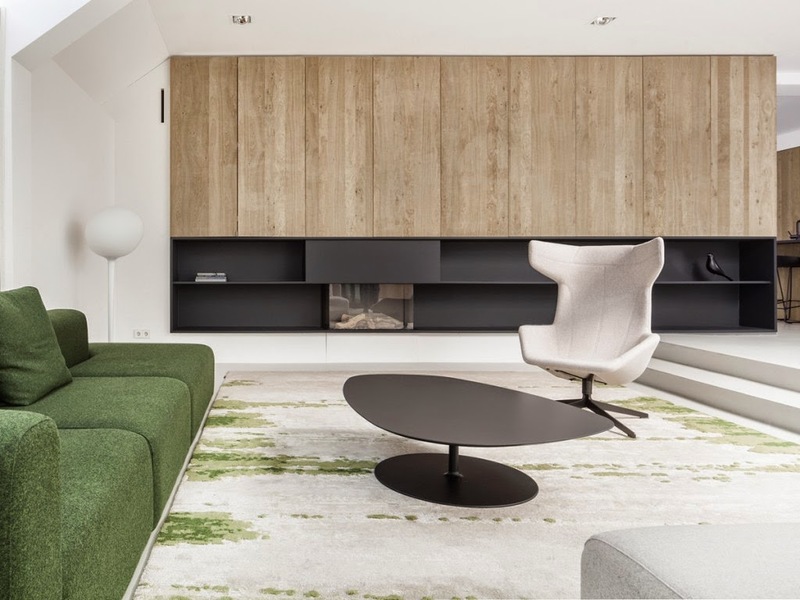 The excess of natural light in combination with the soft layer of green and beige resembles the outdoor experience while being inside.